Sadly, it’s true. And here’s just a few examples. You hit a link on some online ‘sponsored’ message, and your phone rings in 3 seconds #$%^$#, or … you get a text immediately. Immediately #$%^$#!!! What? … #$%^$# … I only wanted to get some info emailed to me and, I really don’t want your salesman/woman calling or texting me at 10:00p on a Friday night. Seriously, I don’t. Stop it #$%^$#. You try to find a phone number on a website, only to find they have no phone number, and ONLY an option to email them a request. Uhhhh #$%^$#, did your customer ‘service’ team all get fired, or sent on vacation? Really, now I do want to talk to a human, and I’m a paying customer; can’t find a human to answer a question RE my account, to save my life. Oh, back to the first one. And now, you stalk the #$%^$# out of me, with dozens of emails, calls and/or texts, and it’s barely been 24 hours. Really? … #$%^$# … and you think I want to be your customer now? No, I don’t. I’ll find another to give my hard-earned dollars!! Or often, I’m not looking to buy now, unless it’s shampoo, and I’ll order that online and, it’ll be at my door in a day or two. I’m just interested in learning more about this insurance option, on my own time, or home refinancing, on my own time. In the meantime, I’ll just go grocery shopping at my favorite #HEB, or #Randalls, and I’ll find what I want, in person, like a human – and me still shopping for my own groceries, and choosing my own apples. Get this. Go to your local branch of your ‘major’ bank and ask to speak to a customer service rep who’s sitting there to answer customer’s questions. So you ask your question. They pick up the phone, and call the same 800# you could call, and they ask the question of their ‘rep’ online, with a code word at the front so they know it’s an internal inbound ‘branch’ call. Uhhh, really, this is how you do it now? #$%^$# – What happened to your customer service, did they all get fired, or you forgot to train them to help me with even basic questions, in person? I’m paying you – I’ll find another bank to do business. Today. And let’s not forget now, the robo dial calls and texts, even though you’re on the DO NOT CALL list, and it’s been checked and verified. Did you forget to check that, any of you? I spent time listing myself there to avoid these antagonists frustrations, and you maybe ‘forgot’ to purge that list, so you can email me instead. One email would be nice, not 30 in a week. Really? #$%^$# … uhhh no, you’re stalking the #$%^$# out of me, so I’ll just BLOCK you. How’s that for cutting off your robotic marketing? … now what, you’ll camp at my house or office, and catch me heading to the grocery store? Seriously? Marketing, this is not. Sales, this is not. Yes, there’s a powerful benefit to online targeting and yet, there must be a limit to stalking #$%^$# that’s going on today. It’s insane. Insane. Do you want to be stalked? No. Do you want to be texted incessantly? No. Do you want to get phone calls, repeatedly, and all hours? No. Do you buy a vacuum cleaner, then want retargeting for vacuum cleaners? No. Do you want to choose your path, and how you interact with companies? Yes. Do you want valued relationships with companies that value your business? Yes. Get the point? It’s not that difficult – it’s basic human psychology. Very basic, i.e. it’s not that difficult to understand and, even yourself as an example, you don’t want it either. Yes. And to think, we stalk #$%^$# them to frustration and agony then, we wonder why they don’t buy. Hold on while I finish LMAO, OMG – what the hell? Is this for real? Someone must be punking me, right? Where’s Ashton Kutcher when you need him? Yikes. In our business, we speak with marketers every single day – EVERY.SINGLE.DAY of the week. And guess what, they’re all mostly very frustrated. Their sales teams are frustrated, and no one’s much answering the phone any more, rarely responding to emails (unless it’s a known contact), and uhhhh … getting a H2H or F2F meeting these days is near impossible anymore. It’s an epidemic we call ‘bunkering’ and it’s a sad result of a shameful practice. 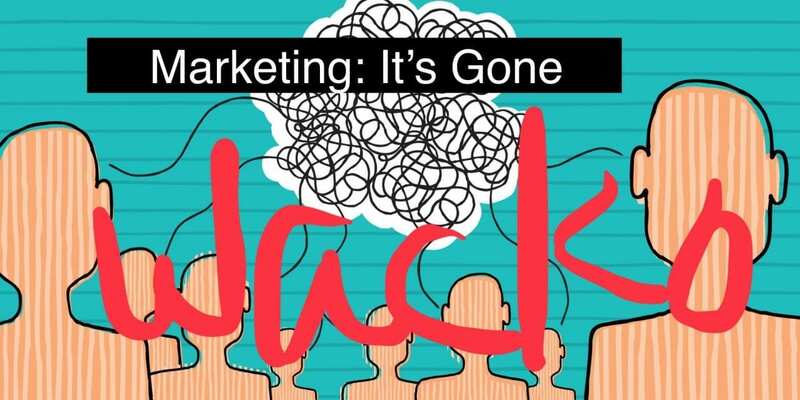 Read the articles, there are many on these topics, and it’ll only get worse, except for those marketers and sales managers who want to give their customers a more bona fide and productive experience. Honestly, these days, it’s not that difficult to set yourself (your company) apart and above the competition. To start, stop stalking people – it’s not working to produce the result you want and, IN FACT, it’s producing the opposite affect. If you want to reach people, i.e. your customers, how about sending them a little gift, or a nice gesture of goodwill, or offering them an advantage to doing business with you? 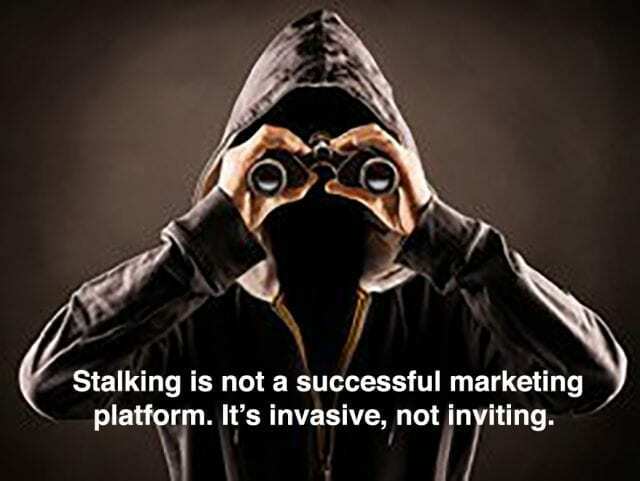 Or, what about NOT stalking #$%^$# them? Simple steps cause big results, and this ‘marketing’ madness must come to a halt or, you’ll soon find yourself with fewer customers. Company after company (large and small) are denoting the reality of this situation and, luckily, some are taking prompt action/s to reverse the saga/mess and, building valued relationships with their customers and prospects. It’s not that difficult but first, you must stop the insanity. Shared in truth and a bit of humor, and happy to chat any time. These topics are important, and apply mostly equally to both B2B and B2C targeting. Some products/services do well with the online-only options, yet many do not. Think carefully how you’re cultivated a relationship the customer WANTS to have with you and your company. Try being a customer of your company, and see how it goes. I’ve personally coached many CMO’s to do this, and create a fake profile for a test and, 95% of the time, they call back crying and/or screaming. Yes, they found the truth, the reality of overwhelm on their own, firsthand, and they wouldn’t want to be a customer of their own company. Sadly, that’s both humorous, and horrifying. It’s time we take smarter/better action, and caring for our customers better, more intuitively, and giving them an experience they’ll want to repeat. Now that’s marketing, and that’s sales – like time-tested and proven over and over. In an age of digital fatigue, offline touch points are being engaged more often by marketing and sales and, not so oddly, performing better than ever, and more so. • Start with the overwhelm of online we each face daily; many are simply hard-to-reach online, much less get their attention, much less meaningful attention. • It’s more distracting than many are willing to tolerate and, yes, although there’s a learning curve evolving … i.e. 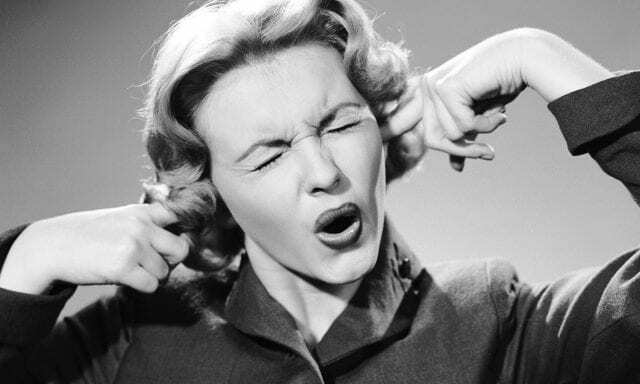 an adaptation timeframe … we’re all flooded with inbound online nuisance constantly these days. • It can be annoying and, for any company looking to entice new and prior clients, it’s imperative that engagement work well. As a result, many marketing and advertising decision-makers are layering platforms online and offline to garner amplified results. What McCarthy is talking about is smart direct mail, i.e. automated, sequenced and channeled tangible media. It’s no longer simply the same piece for your entire audience, that’s old-school –and best yet, your messaging lands in their hand ­–in their home or office– and, causing heightened response, and increased user interaction. Let the user specify how they want to be contacted (and contracted). Instead of pushing a channel on them, let your online and offline channels form naturally. For example, American Airlines lets you choose text, voice or e-mail, plus apps and more. As more marketing leaders navigate the proper channel balance for their targets, many well-respected in marketing and advertising are increasing investments in offline media, i.e. tangible touch point channels. Specifically, as they realize that many of their targets are not always online (or ever, for some targets/users). And, easy clicks in many cases are not generating enough throughput in the sales pipeline, at least for sales to engage, integrate, and close. This applies to most all B2B categories, and many, but not all, B2C categories. It does vary by product and/or target. As a result, the balance of ‘layered media’ is returning full swing today, embraced by many, even while cultivating online channels. Many have already added new expressions of layered offline channels and, they are now garnering even better results with both, specifically by adding tangible touch points. May seem old-school, but it’s working. In a study conducted by a F500® company, they compared the qualified response rates of online-only vs. online+offline side-by-side, meaning they also deleted those leads generated that were of no value, i.e. not qualified for further engagement. Their online-only group delivered less than 1% qualified call-to-action vs. online+offline, which was their existing online platform layered with an Audience Innovation tangible touch point platform, for B2B specifically in this case. Their target was high-level B2B c-suite execs (an enterprise channel), and delivered +56% CTA. Wow, seriously – AND, this target is considered this company’s most difficult-to-reach of their B2B targets, mostly high-level C-Suite executives. It’s not that either is better, specifically – simply, it’s that the two (in combination) produce an exponentially greater volume than either alone, and by a large X-factor. Their sales force was pleased, and had better quality leads as a result. And, it makes sense – tangible touch points last much longer than digital touch points, at least many of them, like 3-weeks vs. 3-seconds in many cases. And, they express an interest that’s not as common today, while more engaging in-person, and … they stand out more – i.e. they make a bigger statement of interest. People notice. When are we going to understand that people do not ‘spend time’ online? They exist in a world where reality blends the two. Digital stuff is just another channel how we live. It’s not a choice. It’s not a behavior. We don’t ‘go to the power grid’ to boil a kettle, we just make tea. In the same way, we don’t do digital banking, online dating or ecommerce, we just send money, go on dates and buy stuff in 2018. 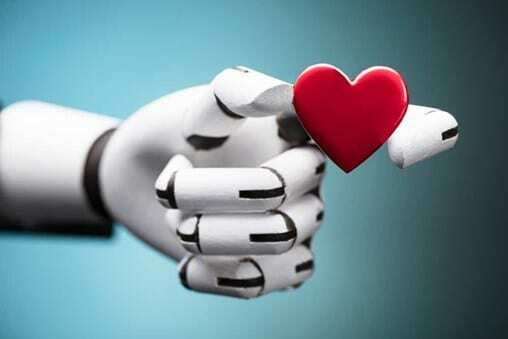 At the end of the day, regardless of whether you’re in marketing for a business-to-business (B2B) or business-to-consumer (B2C) organization, it’s about creating human-to-human (H2H) connections. With H2H marketing, it’s about creating a compelling narrative, a story that people will actually care about. It’s extremely rare to get people to care about your brand unless you already have a certain amount of prestige associated with your company.” Human value. At Audience Innovation, we call this the ‘Lotsa Itty Bitty Carrots Marketing Platform’ and, all joking aside, it’s essential to see its simplicity. Each has a role, and each contributes to the valued moments in the customer journey, compelling the path of engagement, and … funneling sales actions. Then, you have bigger carrots that are your offline touch points, whose job is designed to amplify your valued relationship, and vested as a ‘target’ your company will now invest more than ‘just banners’ forward. 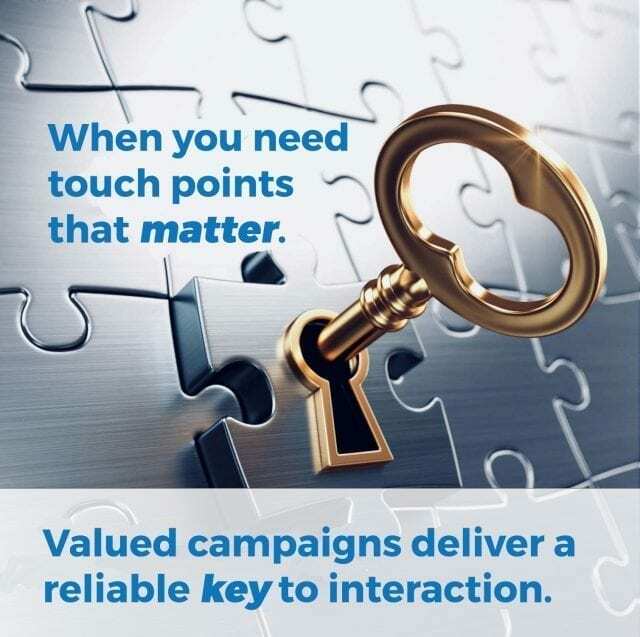 These are tangible touch points that deliver direct connection, interest and reaction and, should be coordinated with the sales force to optimize targeting choices, and a simple plan for their interaction in reverse (with the same targets). As we’re all planning our target strategies for Q4’18 and into 2019, many are now considering the impact and ROI of their most robust online PLUS offline targeting platforms, along with the validation it’s already working. Thus, the blended or layered messaging sequence is producing greater results and, creating more engaged end users, qualified end users for our sales force to engage. It’s simple – humans did not stop engaging with tangible touch points of value; they simply have a new intangible option that’s also part of their daily routine. It’s the ‘lotsa little carrots’ in the marketing equation for your targets and, there’s no denying the baseline impact, and cutting through the clutter while establishing a long-term value asset with each customer/prospect relationship. As marketers, our challenges involve growing everything from building awareness to generating sales results and, 1,000+ other goals and objectives – it’s not easy. It is, however, very motivating to understand how we’re best-served by engaging our audiences both online and offline and, the value-to-interest equation is increased with each succeeding engagement asset, i.e. sequenced steps online plus offline, engagement and interaction. As a result, customer-connection is stair-stepped upward via little bitty baby steps. We build impactful story-telling touch point platforms that amplify highly-valued customer connection. It’s a sales-minded valued asset. When It Comes to Building Your Brand, Every Touch Point Matters – Inc.